For any positive integer n, prove that n3 - n divisible by 6. Prove that the square of any positive integer is of the form 5q, 5q + 1, 5q + 4 for some integer q. Show that any positive odd integer is of the form 6q + 1, or 6q + 3, or 6q + 5, where q is some integer. Let a be any odd positive integer we need to prove that a is of the form 6q+1 , or 6q+3 , or 6q+5 , where q is some integer. Basic definition of even (divisible by 2) and odd numbers (not divisible by 2) and the fact that addition and multiplication of integers is always an integer are applicable here. Show that the square of any positive integer cannot be of the form 6m + 2 or 6m + 5 for any integer m.
Let x be any positive integer. When we divide x by 6, the remainder is either 0 or 1 or 2 or 3 or 4 or 5.
x = 6a or x = 6a + 1 or x = 6a + 2 or x = 6a + 3 or x = 6a + 4 or x = 6a + 5. 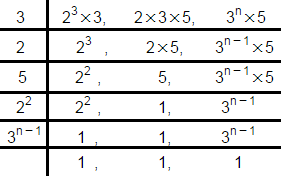 Here, x is of the form 6m or 6m + 1 or 6m + 3 or 6m + 4 or 6m + 10 or 6mn + 19. So, it cannot be of the form 6m + 2 or 6m + 5. Show that the cube of a positive integer is of the form 6q + r, where q is an integer and r = 0, 1, 2, 3, 4, 5. Then, it is of the form 6n, 6n + 1, 6n + 2, 6n + 3, 6n + 4 or 6n + 5. Thus, the cube of any positive integer is of the form 6q + r, where q is an integer and r = 0, 1, 2, 3, 4, 5. Show that one and only one out of n, n + 4, n + 8, n + 12 and n + 16 is divisible by 5, where n is any positive integer. Given numbers are n, n + 4, n + 8, n + 12 and n + 16.
n = 5q, 5q + 1, 5q + 2, 5q + 3 or 5q + 4 for any natural number q. Hence, in each case, one and only one out of n, n + 4, , n + 8, n + 12 and n + 16 is divisible by 5. Show that the square of an odd positive integer can be of the form 6q + 1 or 6q + 3 for some integer q. We know that any positive integer can be of the form 6m, 6m + 1, 6m + 2, 6m + 3, 6m + 4 or 6m + 5 for some integer m.
Thus, an odd positive integer x can be of the form 6m + 1, 6m + 3 or 6m + 5. Thus, the square of an odd positive integer can be of the form 6q + 1 or 6q + 3. A positive integer is of the form 3q + 1, q being a natural number. Can you write its square in any form other than 3m + 1, 3m or 3m + 2 for some integer m? Justify your answer. So, this must be in the form 3q, 3q + 1 or 3q + 2. Thus, square of a positive integer of the form 3q + 1 is always of the form 3m + 1 or 3m for some integer m.
Show that the square of any positive integer cannot be of the form 3m + 2, where m is a natural number. Thus, the square of any positive integer cannot be of the form 3m + 2, where m is a natural number. Find H.C.F. of 592 and 252 and express it as a linear combination of them. Find the largest number which divides 615 and 963 leaving remainder 6 in each case. Using Euclid's division algorithm, find the largest number that divides 1251, 9377 and 15628 leaving remainders 1, 2 and 3 respectively. 105 goats, 140 donkeys and 175 cows have to be taken across a river. There is only one boat which will have to make many trips in order to do so. The lazy boatman has his own conditions for transporting them. He insists that he will take the same number of animals in every trip and they have to be of the same kind. He will naturally like to take the largest possible number each time. Can you tell how many animals went in each trip? Explain why 7 x 11 x 13 + 13 and 7 x 6 x 5 x 4 x 3 x 2 x 1 + 5 are composite numbers. Explain why 3 × 5 × 7 + 7 is a composite number. The given expression has 7 and 16 as its factors. Therefore, it is a composite number. (vi) 24, 15 and 36. Find the least number that is divisible by all the numbers between 1 and 10 (both inclusive). Prove that is an irrational number. Without actually performing the long division, state whether the following rational numbers will have a terminating decimal expansion or a non-terminating repeating decimal expansion. Write the denominator of the rational number in the form 2m × 5n, where m, n are non-negative integers. Hence, write the decimal expansion, without actual division. A rational number in its decimal expansion is 327.7081. What can you say about the prime factors of q, when this number is expressed in the form ? Give reasons. Exponent of 2 in the prime factorisation of 144 is 4. So, the correct option is (a). The LCM of two numbers is 1200. Which of the following cannot be their HCF ? We know that LCM of two numbers is divisible of HCF of these two numbers. (a) 1200 is divisible by 600. So 600 can be the HCF. (b) 500 cannot be the HCF because 1200 is not divisible by 500. (c) 400 can be the HCF because 1200 is divisible by 400. 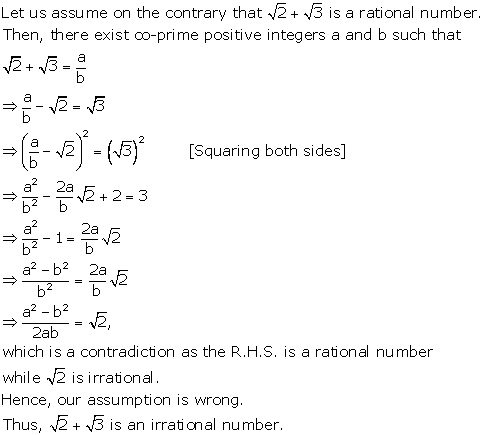 (d) 200 can be the HCF because 1200 is divisible by 200. So, the correct option is (b). exponent of 10 in n is 3. Hence number of consecutive zeros in n is 3. Hence sum of exponents is 4. So, the correct option is (c). No further common division is possible. Hence HCF (95, 152) is 19. So, the correct option is (d). If two numbers have HCF = 1 then after squaring the numbers their HCF remains equal to 1.
so p2 and q2 are co - prime numbers. Ex : 2 and 3 are co - prime numbers. Hence, 4, 9 are also co - prime. So, squares of two co - prime numbers are also co - prime. *Note: Since the book has a typo error, the question has been modified. It is given that 7 is the least prime factor of number b so least possible value of b is 7. Hence the least prime factor of a + b is 2. We know that decimal expansion of a rational number is either terminating or non-terminating and recurring. So the correct option is (b). (b) If two numbers are co - prime then their HCF must be 1 but LCM can't be 1. (c) If two numbers are composite then their LCM and HCF can only be equal if the two numbers are same. (d) If the numbers are equal. ⇒ m = ….., -2, -1, 0, 1, 2, …..
⇒ q = ….., -2, -1, 0, 1, 2, ….. Hence, correct option is (d). a = 4(-1)(-1 + 1) = 0, which is divisible by 8.
a = 4(0)(0 + 1) = 0, which is divisible by 8. A = 4(1)(1 + 1) = 4(2) = 8, which is divisible by 8. Euclid's division lemma states that for two positive integers a and b, there exist unique integers q and r such that a = bq + r, where r must satisfy 0 ≤ r < b.